Adam Ehrlich Sachs’ debut, Inherited Disorders: Stories, Parables & Problems (Regan Arts), consists of 117 wry and finely wrought snapshots of a not-super-healthy father-son relationship. Though the characters change, and the settings range across many centuries and countries, Sachs considers each chapter a different (but equally absurd) angle on the same dynamic. He originally set out to write a more conventional novel, but stalled out and stumbled across the fragmentary form while on a break. Sachs abandoned the straightforward narrative, and the break became the book. Thomas Bernhard is Sachs’ favorite author, and he cites Bernhard’s The Voice Imitator as Inherited Disorders’ greatest influence—beating out Kafka’s parables (and Kafka influencer Heinrich von Kleist), Kurt Vonnegut, Lydia Davis, and J. Robert Lennon. Which is silly, because the man went to Harvard, wrote for the Lampoon, had a successful (if brief and demeaning; see below) screenwriting career, and has seen his fiction appear in The New Yorker, Harper’s, The Paris Review, and McSweeney’s. Most 30-year-old writers would kill for this resume. But if we learn one thing from Inherited Disorders, it is that a son’s achievements—no matter their magnitude—are rarely if ever enough. Evan Allgood: It took you awhile to find the right form for this story. How long did you spend on the book? 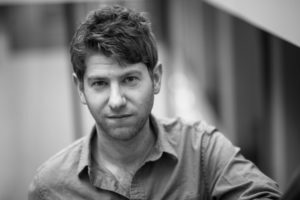 Adam Ehrlich Sachs: The whole process, including the years of failing to write a more conventional novel, was like three years. It was a year and a half or so of actually producing these things. At a certain point I started to feel crazy and depleted, and I knew it was time to give it up. Why do you think you failed to write a more conventional novel? One problem with me trying to write a novel is that I get disgusted with whatever I’m working on after three days. It’s very systematic. Day One I’m really excited. Day Two is like, “Oh my god, genius, this is all coming together.” Day Three is like, “There’s something not quite right about this,” and then I have a night of terrible insomnia, and I wake up destroyed, and I delete it. So it was nice because none of these stories took me longer than three days. I could just complete one, type another number, and move on. I ended up cutting dozens, a hundred or so. But at the time I could protect them from myself and move on, knowing that I could cull them later. Did the form start to feel limiting or frustrating at any point? The restrictiveness was generative. I’m one of those believers in constraint, so what was hard in trying to write the more traditional novel was the feeling that it could go anywhere. Once I pared back the kinds of things that could feature in here, that’s when the ideas started coming and it started getting stranger and stranger. Which was a good feeling, because being restricted to this form meant to come up with something new all the time. I had to keep turning my brain one click further. Until I started getting sick of it and myself, it was a productive constraint. The book references a “horrible year in Los Angeles.” What was your screenwriting experience like? In college I wrote for the Harvard Lampoon, and a lot of people go from that to writing for TV and movies. Not so many go on to write fiction. So I came to New York after college, and I wrote a screenplay, an indie comedy—which had some father-son stuff, in retrospect, though it’s not worth summarizing. I had also written a piece for McSweeney’s, and this great manager—who’s now a friend—read it and emailed me out of the blue and suggested I write a spec screenplay. I did, and he sold it. Right. That part was good. I felt like I was about to conquer LA. I never moved there, but I sold the script and flew out there and took these meetings and felt very impressive. Like, going couch to couch meeting executives and drinking bottled water. I thought I was about to be pretty rich and successful, and that did not happen. You had already sold your script, so what were you pitching? A lot of studios say, “We bought this script, and we hate everything about it, but we like the concept. It’s a beautiful concept.” This is real: one of these beautiful concepts was a story about a guy who never went through puberty. Suddenly, at age 30, he gets hit in the balls and he goes through puberty. Sounds like an Adam Sandler movie. Did you have much success after selling that first script? I landed one assignment: I rewrote an animated comedy that Casey Affleck had written, I think as a bedtime story for his children. I’m sure I did violence to his beloved story, and it was never made. But otherwise it was a lot of pitching on embarrassing ideas and not getting them. That went on for a couple years. Most screenwriters in LA work on assignment; they’re hired for things. It’s a good life if you’re sought-after, but if you’re on the first rung, it’s a lot of neediness and failure. Of course, so is writing fiction. What you’re describing sounds much more painful than getting passed on by literary journals via email. I don’t mind being rejected by smart people, but when it’s a guy with blonde tips… Being rejected by a frosted blonde executive is a particularly demeaning experience. That happened quite a bit. Right, exactly. That’s the classic LA feeling, I think. This is maybe not the best timing, but I thought your book would adapt nicely to the screen, as a miniseries. Yeah, I’m waiting for a producer to call and say they want to option it. (laughs) Hasn’t happened yet. I would totally take that money. That would be great. Lorne Michaels reads Full Stop, right? Sure. Assuming you don’t make a heroic return to Hollywood, do you think you’ll take another crack at a more traditional novel? Or write another book in this form? I think none of the above, basically. I certainly don’t want to find another theme and then write in the same way. I also don’t think I’m capable of or particularly interested in writing a novel the way they’re written most of the time. I don’t have whatever you need to do that. I also don’t really like reading those. I think that I’ll always have to write in fragments, just to get around my own self-loathing. Yeah, writing in pieces, which I think is a counterpart to Bernhard writing in his single-paragraph form. There’s something nice about the fragment. It’s reassuring in a way. But I would like to figure out a way to situate those in a broader narrative. You gave your grandfather a copy of the book just before he died. What was his reaction? My grandfather was an amazing guy who was sort of the father figure I had in mind throughout the book. He was a Middle European, Jewish intellectual who was born in German-speaking Czech Republic—what is now the Czech Republic. Fought in World War II, was injured. Escaped with his family under cover of darkness, via a cigarette smuggler. He lived through every important event in the 20th Century. He was an incredibly decent and smart guy who was an important figure in our family. He was also a scientist, and he had some skepticism about my writing. He told me I needed to have a profession first, for security. I gave him a copy of the book a couple weeks before he died. I mean this as more of a sign of how remarkable he was, rather than anything about my writing, but he read it, and at 100 years old, he said he’d been wrong. At 100, he gave me his blessing to write. Which was the coolest response I’ll get to this book. My dad likes them a lot too. He laughs at them. He found the copy of the book I’d given to my grandfather, and decided to read a chapter at my grandfather’s funeral. It was “Accepted Donations,” which is about inheriting and trying to deal with a father’s mental qualities instead of his physical belongings. That was a pretty funny scene: my dad was laughing so hard that he couldn’t get through it, and the audience was baffled. Yeah, maybe he was just crying. I probably misinterpreted. I think at this point the book is not doing so well that my future son has anything to worry about. You’re not casting a long enough shadow? I’m watching the Amazon sales ranking—if I climb into the single thousands, I might need to start taking precautions. But I think he’s safe for now. Evan Allgood’s work has appeared in McSweeney’s, The Millions, Paste, and Los Angeles Review of Books. Follow and maybe later unfollow him on Twitter: @evoooooooooooo.